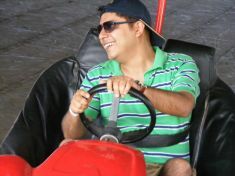 Rahul Sethi is currently an associate with Training Sideways. In his 39 years on this planet he has donned many caps depending on the weather, fashion trends and his mood in general. At times, he has chosen to not wear a cap and let the wind play with his hair. Recently a friend mentioned to me that he wanted to join the HR department in his organisation. After 15 years of working in the Marketing and Sales departments he felt he needed a change, and HR is one of his top choices for a cross-functional shift. He felt that one of his key strengths was that he understood people well and he could bring a lot of value to the HR department with his people-friendly ideas. I was reminded of my own views a few years back when I thought that the HR department in most organisations was anything but ‘human’. When every time I read an email from HR about some policy or rule, I thought it was draconian and despotic. I cursed the HR department for the lousy food in the office cafeteria, the ‘cheap’ choice of venue for the office party, the monumentally boring orientation program for new employees, the air-conditioning that was either too cold or too hot, or even the traffic chaos on the roads of Mumbai! Isn’t HR everyone’s favourite whipping boy? Most employees I had interacted with believed that HR is a glorified butler service or a stooge of the ‘management’, actually a combination of the two. And this was not completely unjustified. In fact, I have seen that many HR team members themselves believe in and propagate this view. Two years ago, I associated myself with Training Sideways – my long cherished dream of being an entrepreneur, an opportunity to work with some mad-hatters like myself, on a radical idea of experiential learning, the joy of working with the performing arts and yet being able to leverage the skills and experiences I had picked up over 14 years in, ironically, Marketing and Sales. In my new role at Training Sideways I interact with HR managers across a very wide range of organisations – big and small, traditional and new age, multiple industries and sectors. So I am not a frog in the well anymore. Yes, some of them have still reinforced my earlier belief about the frivolous contribution of HR to the organisation. But to my pleasant surprise, a lot of them have opened my eyes to the true value that Human Resource Management brings to the table. Any business is basically a strategic combination of ideas and resources. And just like capital, technology and raw materials – people are a resource. In fact, humans are the single most important resource that a business has. Moreover, this resource unlike capital, technology and raw materials, not only executes ideas, it also creates ideas. The art and science of managing the Human Resources of a business is, hence, the single most significant part of running a business. It is not a ‘support’ function. It is the core! And it’s a myth that good Human Resources Management is about being ‘People Oriented’. Just like every other function in the business, HRM must be ‘Business Oriented’. HR strategy is not about keeping people happy and satisfied, rather it is about how to best utilise human resource of an organisation to achieve the business goals. Keeping people happy and satisfied may be one of the many means to best utilise the human resource; and not even necessary that it is the top of the list. Maybe a simplistic analogy, but you don’t hire a CTO to make sure that the computers in your office are well cared for. You hire a CTO to ensure that the organisation makes the optimal use of technology as a resource for business. So my advice to the friend who wanted to shift to HR – shift if you believe you will add value to the utilisation of Human Resources for your company, not just to make your workplace more people friendly.